I was sitting in the airport in Houston, waiting for my flight, when the news came. A friend sent a message: Notre Dame was on fire. I forwarded the WhatsApp note with a “??! !” attached to my wife, who was at home, working in our apartment in the 4th arrondissement, less than 100 yards from the famed cathedral. She stepped into the street and found a wave of panicked Parisians hurrying toward the crooked pillar of smoke that loomed ominously in the short distance ahead. Rounding the corner onto the Quai Bourbon, she faced the worst. Flames engulfed the cathedral, and the two cascades of water arching toward them seemed to have little impact on the fire’s appetite for destruction. Centuries were being consumed in seconds. A monument to faith, an icon of the city, a symbol of permanence in a transient world, a point of reference,–both historically, and for my wife and me, personally–was in danger of being taken. My wife stood, with strangers and neighbors, Parisians and tourists. Some had their phones out and on, recording the horror. Others were too devastated and only stood in disbelief. Many, including my wife, were crying. My wife relayed more news and another photo to me. ‘This cross is now gone,’ referring to the photo below. My heart sank. My flight was boarding. The crew on the Air France flight were pleasant and professional as always, but their usual sparkle was missing. Who could blame them? Exhausted and depressed, I slept as the plane crossed the Atlantic. 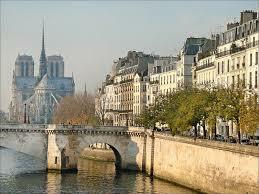 I landed and took the train from Charles de Gaulle Airport into the city. The Notre Dame/St. Michel station was closed, so I was obligated to walk from Les Halles to our apartment, a journey that took me along the Seine. Streets were blocked off. Pedestrians were everywhere. Traffic was snarled more than usual. As I waited at a corner, I looked up and caught a painful glimpse: the charred scaffolding, the altered profile, the full, unforgiving scope of the tragedy. I couldn’t look at it fully just then. It was too much. 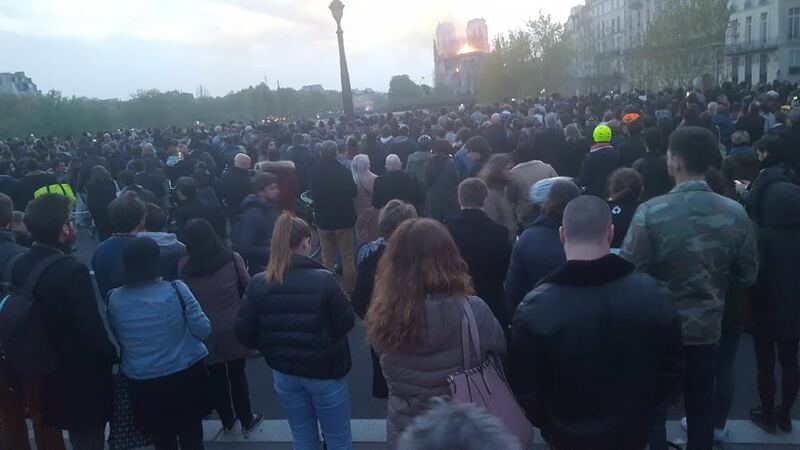 My numbly marched on, nodding my way past the police barricade on the Pont Marie, stepping over fire hoses that still ran from the street toward the cathedral like life-lines to a patient in critical condition. Weary firefighters talked with pensive shop owners. Curious sightseers were ignored–with more intent than usual–by stoic residents. I hugged my wife for a very long moment. She tried to talk about it, but stumbled as the tears welled up, so I rambled about my brief trip, laying a quick summary of events over the open wound that we both knew would take time to heal. A few hours later, I waded back into painful waters. I guessed that the French would try to raise money and repair the place. Yes, my wife agreed, but how could you even begin? It would be so expensive, so challenging, so daunting a task. I circled to my laptop and perused the headlines. As my wife plated up some snacks, I clicked on a report from the Guardian and scrolled down, past the details I was already familiar with. I couldn’t read anymore, so I just wiped my eyes and clicked off the news and on to Netflix. We’d eat something light and watch something light for now. 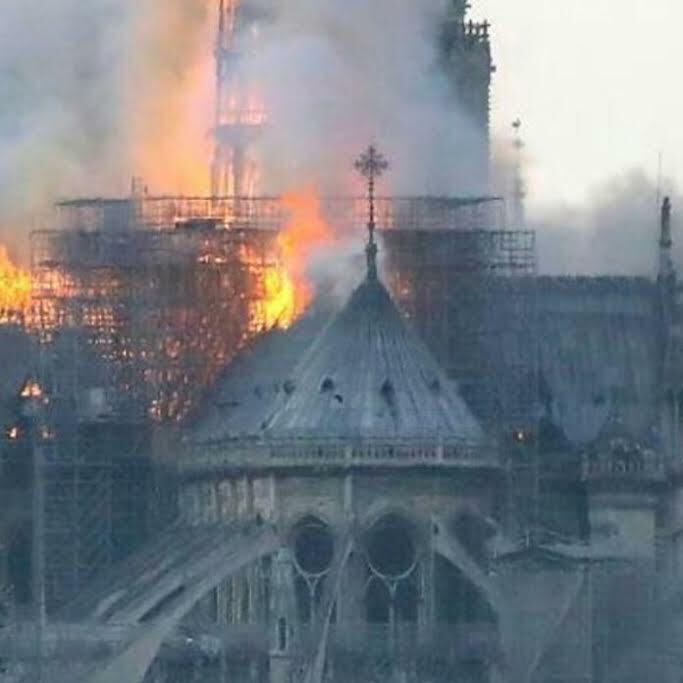 I’ve learned a few things since then: firefighters risked their lives to save the building, and the art inside it; the structure was only minutes away from being completely consumed, if the firefighters hadn’t been so brave; thankfully, only one was injured; President Macron will assemble a team of historians, architects, and builders to resurrect the legendary cathedral; some 750 million dollars is reported to have already been pledged, and donations will, no doubt, continue to pour in from all over the world for months and years to come. Notre Dame will never be the same, but it will be rebuilt. As she was, before the fire. Dipping into my cafe this morning, I found a subdued friend who still kissed me on both cheeks, and still made a great cup of coffee for me, despite recent events. She knew I’d gone to Houston for a funeral. She’d endured a loss, as well. So had Paris. So had the world. “C’est difficile,” I quietly offered. She nodded, but before she could speak, other customers entered the cafe. She patted my hand, straightened herself quickly, and spun to the front door with a smile. “Bonjour!” she called to the group. “Bonjour!” they echoed back optimistically. The French have endured and overcome a lot, I thought to myself as I watched the melange of passersby through the cafe window. The reigns, the revolutions, the Nazis. They’re a quirky bunch, they’re an emotional bunch, but, damn it, they’re a resilient bunch. Notre Dame was a singular loss, but their response would be uniform: firm, comprehensive, and inspiring. Thank you for this, Byron, so much. Your experiences and perspectives soothe my heart. I was one of the millions watching the destruction unfold live via the Internet. I cried with you and your wife, relieved, in part, to have visited Our Lady only a year or so ago. Please send love and a warm American hug from me to your wife. I can only imagine what she went through seeing Norte Dame burn before her very eyes. God bless you both. I share the sadness. For me, Gothic cathedrals are the most extraordinary monuments. Their scale, elegance and lightness, despite the massive loads, it’s just amazing. So, I’m not surprised that the French feel deeply affected. What does surprise me is that the degradation of Enlightenment values doesn’t seem to generate the same scale of reactions. In recent months, protesters clearly went beyond what is acceptable. A French philosopher was insulted on the street, as if he were a lower being. Not to speak of the considerable support for extremism. That, I find as sad as a national monument going up in flames. For, what’s the point of feeling proud of our built heritage, if we can’t uphold our values in the present? The Notre Dame will be rebuilt. I hope it’s an opportunity for the French to also restore unity, or at least soften their divisions. I’m not the first to say this, Byron, but this fire might have been a blessing in disguise. France has been burning for a while now, but its people lacked the unity to do anything about it. If this catastrophe brings them together, and helps them see the bigger picture, it may just be a good thing. Thank you for sharing your story. What a memory, walking through the streets that day. Here in the U.S., I could hardly watch it even though the images were everywhere.I heard a BBC news program about what was going on in the world 850 years ago, and what had not even happened yet at that time, and it is astonishing. Equally troubled by the news here (I visited in the winter of 1986), but I have been heartened to learn that quite a few artifacts were saved, and a number of the stained glass windows somehow spared. What was the name of the priest who headed into the flames to grab what he could? The plans to repair and rebuild fairly quickly are admirable if not a tad ambitious. Anywhere to make small donations via PayPal perhaps?